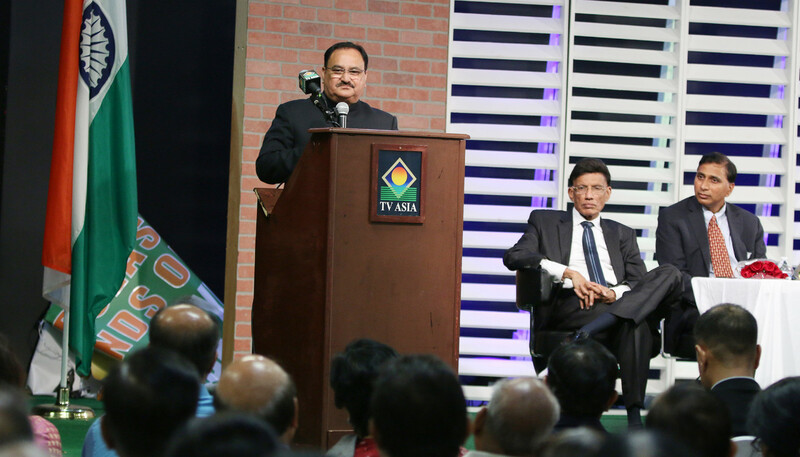 J P Nadda, India’s Health and Welfare minister, was hosted at a community reception at the TV Asia auditorium in Edison, NJ, on Sept. 24, by the Overseas Friends of BJP (OFBJP), TV Asia and the India American community. Nadda was welcomed at the community interaction by H R Shah, TV Asia chairman and CEO; Krishna Reddy Anugula, OFBJP president; Jayesh Patel, past-president of OFBJP and Dr Sanjay Gupta, president of American Pain Association. Himachal-born Nadda, who was inducted as a minister in 2014 and is also a lawmaker from Rajya Sabha, is currently spearheading Narendra Modi government’s flagship Ayushman Bharat-National Health Protection Mission. During the interaction with members of the community, Nadda spoke fluently in English and Hindi, peppering his speech with easy-to-understand statistics. Nadda thanked the Indian American community for their diligent work in enhancing India’s image in the US. While the Modi government, he said, was especially committed to uplifting the marginalized in India, there had been a gradual transformation in the political culture in the country. “Since the Modi government took over, we have seen a shift from political paralysis to political transparency,” he said to a thunderous applause from the audience. Nadda laid down his government’s achievements, including the many schemes that have been launched to expedite participation in the banking, social security, insurance and healthcare sectors in the country. Explaining the newly-launched “revolutionary” Ayushman Bharat-National Health Protection Mission by the Modi government, Nadda said the new scheme will bring a paradigm shift in the country’s health sector. Under the new scheme, health insurance up to Rs 500,000 for every poor family in the country will be totally cashless and no registration will be required. “The poor people will not have to pay money for hospitalization,” he said during his speech. A “golden card” will ensure their cashless treatment, he noted. In case a person does not have a card, he or she will be treated in any one of the 13,000 hospitals, which are part of the Ayushman Bharat scheme, after taking the person’s thumb impression, Nadda said. Ayushman Bharat rests on the twin pillars of Health and Wellness Centers for provision of comprehensive primary healthcare services and the Prime Minister's National Health Protection Mission for secondary and tertiary care to 100 million families. Nadda said India firmly believed in the objective of attainment of the highest possible level of health, a state of complete physical, mental, spiritual and social well-being and not merely the absence of disease or infirmity. "Moving toward this objective, we have adopted the National Health Policy 2017 with the aim to provide affordable healthcare for all," he asserted during his speech. He said that under the BJP government, 98 new government medical colleges have been built just in the last four years. The central government pays Rs 250 crore to each medical college in the country. Nada also pointed out that the Health Ministry had started a unique initiative called AMRIT Deendayal, an acronym for Affordable Medicines; Reliable Implants for Treatment - Centers that provide medicines for cancer; cardiovascular diseases and cardiac implants at significantly reduced prices. The government had also opened Jan Aushadhi (peoples' medicines) stores to make available quality affordable essential medicines to people in need, he said. “India has always supported regional and global public health issues whether it be advocacy, technical collaboration, research and development, partnerships or improving the accessibility and affordability of health services and high quality essential medical products,” Nadda added. While welcoming Nadda, TV Asia’s H R Shah said TV Asia was built on the premise of helping the community and it was always there to assist in way possible. He called on Indian Americans to help the motherland and ensure the Modi government was elected for another 5 years, “since 5 years were not enough for any government to fully implement or produce results. OFBJP’s Krishna Reddy said it was imperative for every Indian American to work to re-elect the Modi government if India had any chance to become a global leader. He also mentioned that NRI voting may soon become a reality. Dr Jayesh Patel of OFBJP thanked all 21 chapters of OFBJP in ensuring NRIs and other countries were plugged into India’s progress. 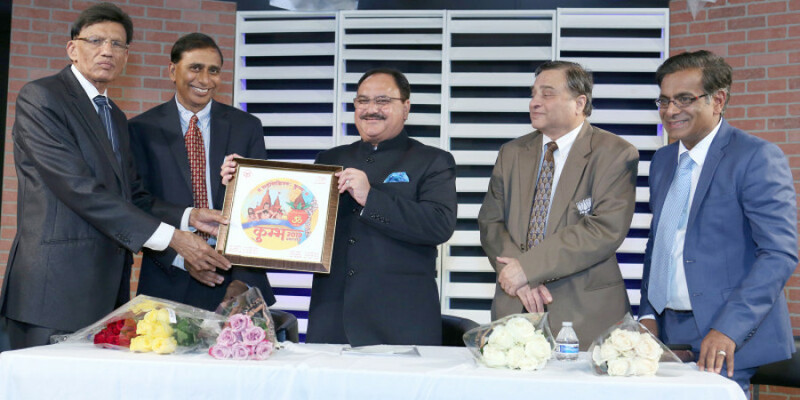 Toward the end of the event, a plaque commemorating Kumb Mela and the Pravasi Bharatiya Diwas, scheduled in Varanasi in January 2019, was presented by the guests to Minister Nadda. 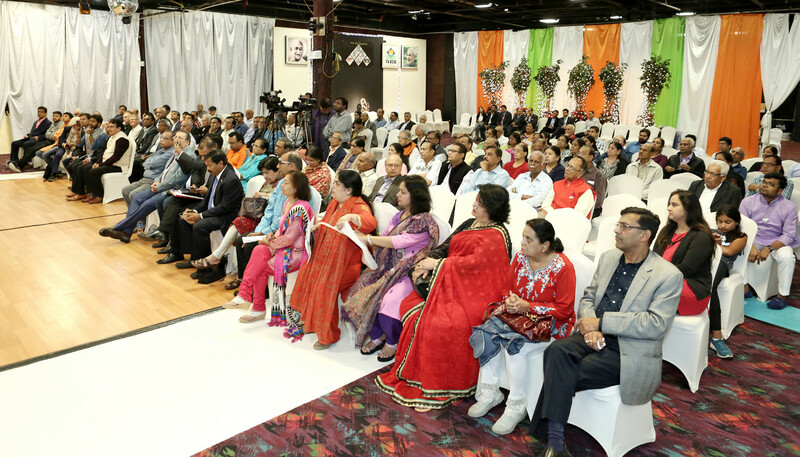 More than 300 guests, including several prominent members of the Indian American community, attended the event. After the event, Nadda was interviewed in a special segment to be aired subsequently on TV Asia across the US.